Dave Navarro began his music education on the piano at the age of 6, but dropped the instrument in favor of the guitar by the time he was 12. His early years were disrupted by increasingly traumatic events, beginning with the separation of his parents when he was 7 and culminating the the murder of his mother and aunt by his mother's ex-boyfriend when he was 15; a pronounced inclination towards the morbid in Navarro was the inevitable result. Exposure to the songs of Jimi Hendrix convinced him that his future was as a rock musician, and he subsequently devoted as much time as possible to honing his playing ability. While still in school he formed a "classic rock" cover band with friends, later moving on to speed metal with the band Dizastre. By his junior year in high school he had dropped out, and shortly afterwards moved to Westwood to pursue the life of a professional rock musician. In 1986 Navarro joined Jane's Addiction, a band which already included members from his earlier projects. Its blend of heavy rock, psychedelia and punk quickly earned them a following first in Los Angeles and then beyond; a self-titled debut (which, atypically, was a live recording) surfaced the following year on the Triple X label. Young, hot blood inevitably attracts the major label vampires, and by 1988 Warner Brothers had slithered past the competition to wrap its noisome coils around Navarro and his bandmates. Two studio albums would result: Nothing's Shocking (1988) and Ritual De Lo Habitual (1990). Later in 1990 Jane's Addiction would headline the first Lollapalooza -- a touring festival organized by its singer Perry Farrell, which included an extensive line-up of acts admired by Jane's members. The tour served as the midwife for the band's destruction, with its combination of drug abuse, personal conflicts and life-on-the-road pressures making continuation as a unit impossible by 1992. After leaving Jane's Addiction, Navarro was briefly involved in the band Deconstruction, with whom he recorded a single album in the mid 1990s. Both Guns n' Roses and the Red Hot Chili Peppers courted the guitarist during this time, and he initially declined both offers; in 1993, however, he allowed himself to be lured into the ranks of the Chili Peppers, remaining with them until 1998. 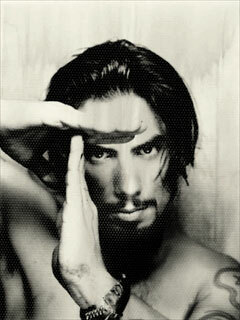 Along with fellow Pepper Flea, he also participated in the first of several Jane's Addiction reunions in 1997, recording a few new songs for a rarities collection and undertaking a short tour. For the remainder of the 90s Navarro concentrated on work in a new band named Spread and sessions for artists like Nine Inch Nails, Marilyn Manson and Alanis Morissette, as well as accepting remix duties for Janet Jackson and Traci Lords. Navarro's first solo effort appeared in 2001, originating in his three years of performing with Spread. That same year he joined another Jane's Addiction reunion tour of the States, paving the way for more extensive touring and the band's return to the studio. In 2002 he formed an assocation with Camp Freddy, a high-profile covers band created by Billy Morrison of The Cult, and began recording a new Jane's Addiciton record, released in 1993 as Strays. Occasional stints as an actor, columnist and fashion model also kept him from having too much free time on his hands. Admitted experimenting with other men, in a May 2006 interview with the online publication dot News Magazine: "I will tell you that I've come to realize through my experimentation over the years that I'm not gay, nor am I bisexual. But at least I know that in the sense that I've never been aroused by a man, but I've been in situations where I could potentially be aroused. Since it didn't work, I know I'm not gay. So I was open to it working, let's just say that." But if he had to be gay, he'd be gay with Johnny Depp.